Summon another player when you need help. 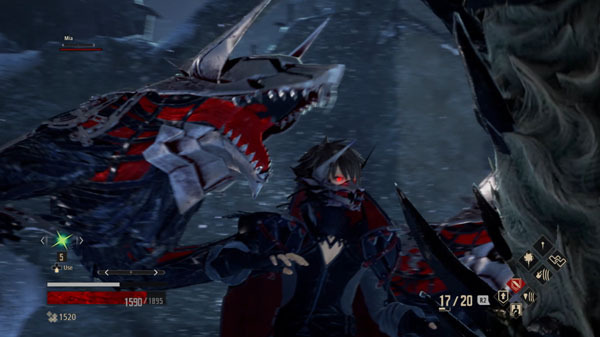 The latest issue of Weekly Famitsu has first details on Code Vein‘s multiplayer component. Multiplayer – Clear dungeons with other players alongside your NPC partner. If you send out a distress signal, a player who has met certain conditions can come to your rescue. The rescue player appears alone, but can travel with you as a party character alongside your NPC partner. Your NPC partner’s Gifts will also have an affect on the rescue player. Communication – Create single emotions that combine gestures, stamps, and voices. You can save the emotions you create for later use. Use emotions to quickly communicate tactical intentions and player situations. Karen (voiced by Yumi Hara) – A collaborator of the Q.U.E.E.N. Project. Louis’ older sister. Chris Silva – A Q.U.E.E.N. Project test subject. Gregorio Silva’s daughter. Code Vein is due out for PlayStation 4, Xbox One, and PC worldwide in 2018. Thanks, Hachima Kikou and Ryokutya2089.